Dirty Fruit? Consider this Organic Recipe. How clean is the fruit that the Atlanta Home Inspector eats? Have you stopped to wonder how many have handled the fruits and vegetables from the market? The only way to know how clean your fruits and veggies are, is to home grow and organically clean them. As busy as home inspectors in Atlanta are these days, time becomes an issue for growing your own produce. By coating fruits and vegetables with wax, the grocery can keep the itmes stocked longer. Also consider the pesticides used on your produce while they are still growing. Even organic produce, which is free of harmful pesticides, they are still passed through several hands on the way to the market. Washing your vegetables and fruit in water might not be enough to eliminate the germs. 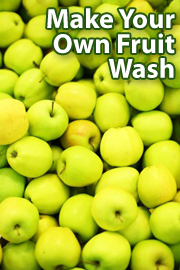 Another option to consider is making your own organic fruit wash. Atlanta Home Inspections has not tried this recipe yet, let us know what you think! Here is what you will need: a large pitcher, 1 cup of white vinegar and 1 TBs of baking soda, 25 drops of grapefruit seed extract, 1 spray bottle. Note: this recipe will make enough wash to last for 1 month. Third: mix and pour into spray bottle. Now you are ready to spray. Spray the wash, coating food, let it stand for at least 5 minutes before rinsing, then run water over the fruit. You might just be surprised at the dirt and chemicals that wash from the fruit. Sharing environmentally friendly and pocket-book savings pointers, the Atlanta Home Inspector hopes that you find this cleaning alternative helpful. Microwaves are a daily convenience. Due to the heavy usage of microwaves, many spills and splatters dot their ceilings and line their walls. Remember that at least once weekly microwaves should be cleaned to optimize performance. Many of us use store purchased cleansers to clean our appliances. However, if would like an all – nautral alternative to clean your microwave, we have a recipe for you. An all-natural approach will yield the same results, with only slightly more preparation time. The chemicals from the store may seep into your foods and containers over an extended period of time. So you are not only saving pennies, but also saving a future health issue from arising. Let us know if this all natural approach worked for you!